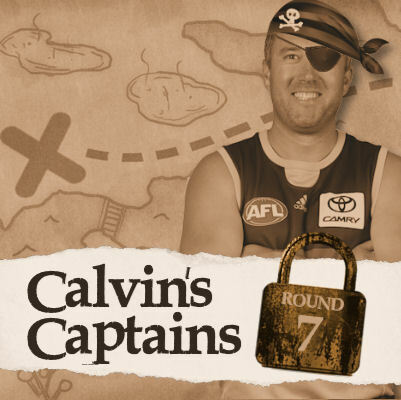 Tired and dusty, but Calvin is back at it again, finding you the best captain for the round ahead. Yes he did, but let’s be clear why I was scared last week with Tom Mitchell, and my fear was justified in the third term when they tagged him properly with Dunstan when he was held to just 17pts. With most of those points coming very late in the term with Dunstan on the sidelines. His quarter splits looked like this… 48-37-17-49. Well done to those who took the gamble after his back to back 83’s, but my points is… my fear was justified… if they did what I predicted in that third term, we could have had another disaster. But obviously they didn’t and that’s why the pig pigged! A picture of beauty. This week, Essendon’s problem of stopping Titch actually sits at about No. 7 on their list of concerns at the moment. They are sh*t and they don’t even have a tagger to use. The pig scored 128 on the Bombers last year and even had 130 against them the year before when he was at the Swans. The best midfielders in the game this year who have cashed in on the struggling Bombers have had a field day with Hunter (148), Gibbs (139), Fyfe (123) and Treloar (122) all topping the list. The big man Max Gawn is currently the #1 man in the game at the moment (on 3 games form) after scores of 135, 143 and 127. This week he is up against the Saints and that means Mr. Tom Hickey. Now, Max played the Saints twice last year for scores of 75 (v Longer) and 111 (v Hickey), but this was when Max… wasn’t really Max. Let put this is simple terms… Max is set for another big day here. He’ll sit at #3 on the list for me this week… I just think you other two ahead of him can be even bigger. Western Bulldog’s Jack Macrae is at a whole new level at the moment and sits as the third most inform player after his thumping 145 last week. He’s up against the Suns this week and they are bloody average, giving up the most Fantasy points this year to their opposition and nearly 6 tons a game over their last three games. Jack scored 93 on the Gold Coast last year and the only small (tiny) concern I have, is a tag from Touk Miller who dominated Zorko two weeks ago. This won’t happen, so rest easy Jack fans cause he will be very very…. Very good once again. Carlton are the second easiest team in the game for opposition midfielders to score against which means… Bryce Gibbs will have a field day against his old club in his first game since switching over to the Crows. Or…. Will Ed Curnow run with his former team mate, to send a message? Maybe… but still, midfielders Macrae (145), Bont (122) and Hunter (104) all dominated the Blues last week and Gibbs and Laird should be awesome. Rory Laird posted 114 last week and will be ridiculous at home in this one. Patrick Dangerfield v GWS @ GMHBA Stadium: 70 last week? You must be kidding me. He did have 114 and 142 on the Giants last year but it’s still a big NO from me. Andrew Gaff v Port Adelaide @ Optus Stadium: 120 last week and had 118, 83 and 82 on the Power last year. Yep, they played three times. Patrick Cripps v Adelaide @ Adelaide Oval: No tag coming again this week. 112, 138 and 76 (tag) are his most recent scores this year and will enjoy it again without any attention. Dusty Martin v Fremantle @ the MCG: Highest score of 111 in his last four games this year and that was with half-a-dozen goals. Scored 124 and 90 on the Dockers last year and that now puts it at 6×100+ scores on them in his last 7 games. Maybe a Banfield tag? Maybe not. Adam Treloar v Brisbane @ the GABBA: #2 lad in the game over the last three weeks at an average of 135. Thumps the Lions with scores of 109, 131, 120 and 115 in his last four and should dominate here. Worth noting, he was tagged in his last game here (109) by Berry. Cops it again? Lachie Neale v Richmond @ the MCG: 138 last week and looked million dollars. Scored 96 and 149 in his most recent against the Tigers. Scott Pendlebury v Brisbane @ the GABBA: 2.8% ownership and the Fantasy Hall of Famer continues to roll with and average of 111 in his last three. Brodie Grundy v Brisbane @ the GABBA: 107 against Stef last year, his best ever score against the Lions. Stephen Coniglio v Geelong @ GMHBA Stadium: Stays with Pendles as the only two who haven’t dropped under 100 this year and hits Geelong at the right time as they are the 4th easiest to score on in the last three weeks, giving up the third most points to opposition midfielders. Zach Merrett v Hawthorn @ MARS Stadium: He’s back alright and currently ranks as the #4 man in the games based on form with an average of 117 in his last 3. Scored 129 and 115 in his last two against the Hawks. Robbie Gray v West Coast @ Optus Stadium: Averaging 115 in his last 3 and scored 108, 76 and 37 on the Eagles last year. No tags. Josh Kennedy v Kangaroos @ the SCG: “He’s back”… or is he? Had 111 last week but let’s remember he scored 66 and 43 before that. Let’s wait a few more before we do anything stupid. Ed Curnow v Adelaide @ Adelaide Oval: 81 last week, that’s what he can do from time to time. Might even run with Gibbs. Stef Martin v Collingwood @ the GABBA: Has only posted 1×100+ score against Collingwood in a career 6 attempts. Only had 64 last year. Good thing he’s not a maths teacher. Thinking of Holman- Mutch and Billing’s- Langdon? Mutch is a good bring-in, but not Langdon (of the injured-hand/leg variety). I’d suggest either Spargo or Ronke instead of Langdon. If you feel you have to move out Billings (and fair enough), why not use the cash from Holman to Mutch to move Billings to likely top 6 forward? That’s where you want to get to anyway and you already have plenty of rookies making you cash / there aren’t other forward rookies you don’t have that are begging to be picked at the moment (i.e., will make you so much cash you have to get them in at all costs). Based on that, I’d suggest something like Holman -> Mutch and then Billings -> someone like Westhoff, M Robinson or T Taranto. On Westhoff, I’m still surprised at how high his average is, considering he’s never topped 90 for a season average and I would have thought he was starting to decline. I had worried about him dropping when Ryder comes back, but according to AFL stats, he only has 11 hitouts for the year, so clearly its not the rucking duties where he is getting his points from. Certainly he looks as likely an option for a top 6 forward as any of the players you don’t already have (other than Franklin, who is of course injured right now). there is no number 5 on the list as well. Gotta get rid of Billings this week not sure who to get. I can get Macrae via dpp, leaving $134,000 in the bank. Or should I get robbie gray/Sam Menegola and save some cash. Amazing article as always mate! Pretty proud to have 8 out of those 10 on my field!